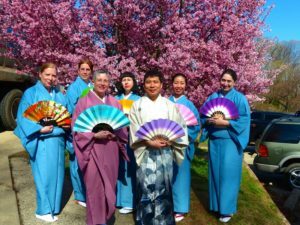 Subaru Cherry Blossom Festival welcomes IchiFuji-kai Dance Association to Sakura Sunday! Founded in 1961 by Miyoko Watanabe (stage name: Fujima Nishiki), IchiFuji-kai endeavors to teach the Soke Fujima style of Nihon Buyo, Japanese classic dance, in a manner accessible to everyone. To aid in the process, Fujima Nishiki developed ways for Western audiences to better understand this interpretive style. Shofuso provides space for IchiFuji-kai to offer classes on Nihon Buyo, taught by veteran instructor Helen Moss, in an authentic setting. Helen Moss (stage name: Fujima Nishiki-no) has taught the Soke Fujima style for nearly thirty years. She has given workshops and lecture demonstrations to introduce people of all ages to the beauty of dance and Japanese culture throughout the Philadelphia and New York areas. Come see IchiFuji-kai’s unique mixture of established classics and new favorites at 2:30 PM on the Main stage! Interested in getting some performance tips? Come to the Matsuri Village stage at 4:00 PM for IchiFuji-kai’s performance workshop! To find out more about IchiFuji-kai, or sign up for classes, visit their website.